The coming-of-age series offers viewers a charming and intimate look at an average American family -- just like yours, only slightly louder and more colorful. The very funny and talented ensemble cast stars Wendi McLendon-Covey, Sean Giambrone, Troy Gentile and Hayley Orrantia , with George Segal and Jeff Garlin. The series is narrated by Patton Oswalt. Featuring Three All-New Behind-the-Scenes Featurettes, Deleted Scenes & a Hilarious Gag Reel! CULVER CITY, Calif. (July 20, 2015) - Get ready to return to the '80s when Sony Pictures Home Entertainment releases the sophomore season of The Goldbergs on DVD September 8. Created by Adam F. Goldberg, The Goldbergs: The Complete Season Two is back to remind us how entertaining life could be in spite of overbearing moms, grumpy dads and annoying siblings. ABC's top-rated comedy hit its stride in season two with some of the most laugh-out-loud moments in network television. The coming-of-age series offers viewers a charming and intimate look at an average American family -- just like yours, only slightly louder and more colorful. The very funny and talented ensemble cast stars Wendi McLendon-Covey (Bridesmaids), Sean Giambrone ("Clarence"), Troy Gentile (Good Luck Chuck) and Hayley Orrantia ("The X Factor"), with George Segal ("Just Shoot Me!") and Jeff Garlin ("Curb Your Enthusiasm"). The series is narrated by Patton Oswalt ("Agents of S.H.I.E.L.D."). 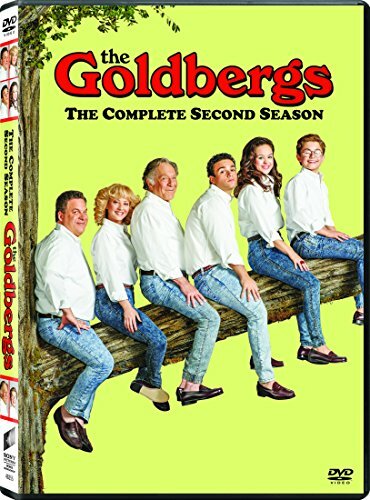 The Goldbergs: The Complete Season Two contains all 24 episodes on three DVD discs, along with deleted scenes, a gag reel and three all-new featurettes. "On Location with Sean Giambrone" follows Sean for a day on set as he attends rehearsals, goes to school and films at the Los Angeles Memorial Coliseum. "Making Barry Goldberg's Day Off" pays homage to the John Hughes film that was parodied in what was a highly-anticipated season two episode; the cast and crew shares thoughts about the original film and how it was recreated. Lastly, "On the Set with Wendi McLendon-Covey" reconnects fans with our favorite TV mom. Wendi spends a day with the camera crew, letting viewers know exactly what it's like to be the matriarch of the Goldberg clan. The Goldbergs is produced by Happy Madison, Adam F. Goldberg Productions and Exhibit A Productions in association with Sony Pictures Television. Adam F. Goldberg, Doug Robinson, Seth Gordon, Marc Firek and Alex Barnow serve as executive producers. The aerobics-loving, mixtape-making, royal wedding-watching Goldbergs are back! This season finds the siblings involved in hoverboard accidents, the treacherous world of male modeling, wannabe pop star making, reenacting Ferris Bueller's Day Off and lots more. The parental units are busy as well. Beverly is at her best meddling and matchmaking when she's not bedazzling everything, while Murray is waging war against Cowboys fans. Love, rad antics and a lot of laughs keep this family together. The Goldbergs: The Complete Season Two is cold- chillin' awesomeness. Broadcast Year: 2014-2015. The Goldbergs: The Complete Season Two has a run time of about 519 minutes & is not rated.